A quick post before I hit the hay tonight. The jog was held this afternoon for the Eventers at 4pm. Luckily it didn’t rain on the parade in spite of it being a very rainy morning. All of the Canadian horse/riders were turned out smartly and breezed through the jog. In fact all horses passed with the exception of Chile’s Ricardo Stangher and Brazil’s Fabricio Salgado. 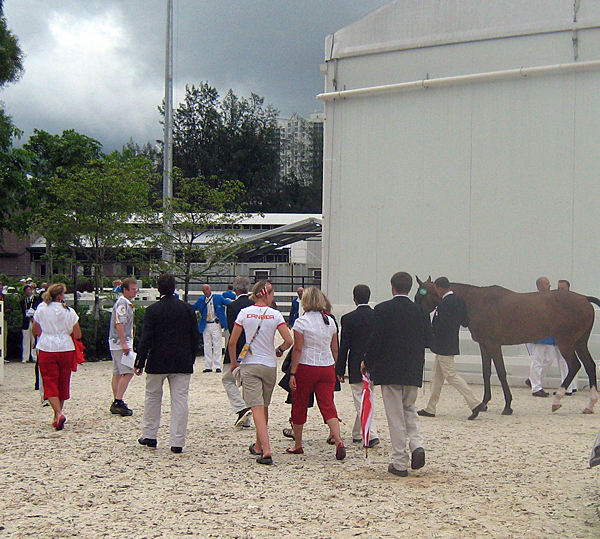 Great Britain’s William Fox Pitt was asked to stay for a second inspection but was eventually passed (the jury was concerned about a girth gall). Dressage starts VERY bright and early tomorrow morning with Canada’s Kyle Carter being the second rider in and the first Canadian, following the one and only Mark Todd who gets the party going at 6:30am. just had to take a snap of this perfectly braided tail. I just watched Canada’s first Dressage test with Kyle going. His horse seemed a bit excited and boy you can sure tell how hot it is out there. I wanted to write and say how very interesting and fun your blog is! The great insider photos you are posting are the best around! I’m so glad to hear the Eventing team horses all passed the inspection and are ready to go! 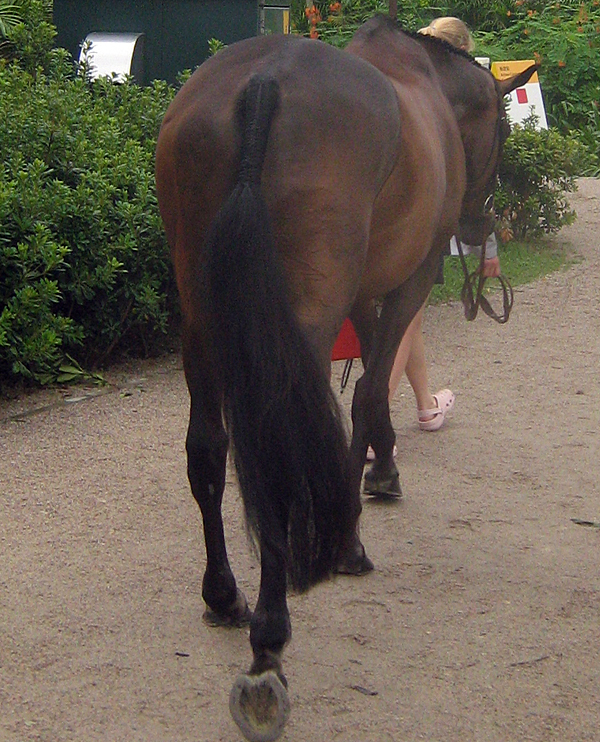 I have a blog for Swedish horses and their enthusiasts. We have been rooting for Selena and Colombo for a long time and interviewed her for an article for the SWANA newsletter. Selena was very gracious and we appreciated her time. There are several posts on my blog about the pair and we wish them the very best. 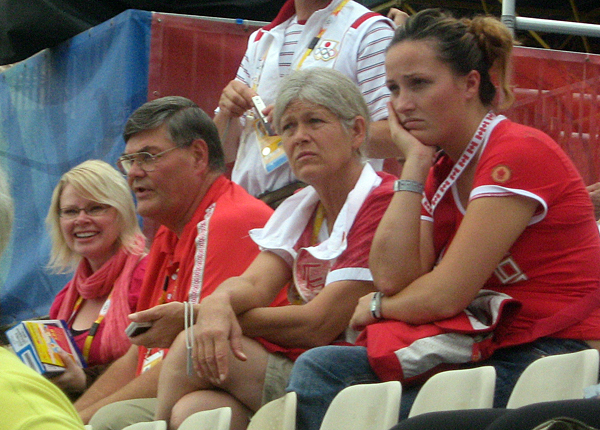 If you remember, please pass on our best wishes to Selena and let her know that we are all behind her and Colombo! Dear Kerri: Your blog is just outstandng!!! Thank you for your tremendous efforts! I loved the item about the elevators; it’s really interesting to share in your experiences and all the news of the Canadian Team! The photos are fantastic, too! If I could be so bold as to suggest putting a link from Dressage Canada to your blog it would be really wonderful because that site has little to no news and more people could and would share in the exceptional adventure you are providing.